When you think of summer, you think of lazy, hazy days spent in the garden with the patio table adorned with melon, strawberries, and crisp crunchy salads and of course, the barbecue that had been shackled away in the garage is brought out and fired up to host a mouth watering array of burgers, kebabs and sausages. It certainly does make for lovely weekends that seem to pass by all too quickly but what if, just what if, salads and barbecues are not your thing and you’d rather have a plate of devilishly hot food regardless of the roasting temperature outside? In Tehran, the sun soaked capital of Iran, temperatures can soar up to 40°C + and yet people will still slave over that hot stove to make the ultimate hot meal – something that would only be considered here in the cold, dark autumn or winter months. One of my fondest memories is that of being in my grandmother’s house in a small village in the south of Iran a few years ago. It was sweltering as we had no air conditioning and we were hungry! A table cloth had been laid on the floor and my grandmother had made heaps upon heaps of steaming hot food from casseroles to plates of rice and baked bread only to be cooled down with a small bowl of yogurt by the side. I remember my senses being seduced by the rich aromas of cumin, cinnamon and turmeric and my mouth waters even now when I recall the taste of my grandmother’s cooking. For me personally, even in the height of summer, nothing will satisfy my appetite more than a hot home cooked meal especially one that evokes memories of happy days in the sun so to share with you, I have added my recipe of one of my favourite Iranian dishes, Musama Bademjan (chicken with aubergine) in the Recipes section! Mix all the ingredients and chill in the fridge for two hours before serving. 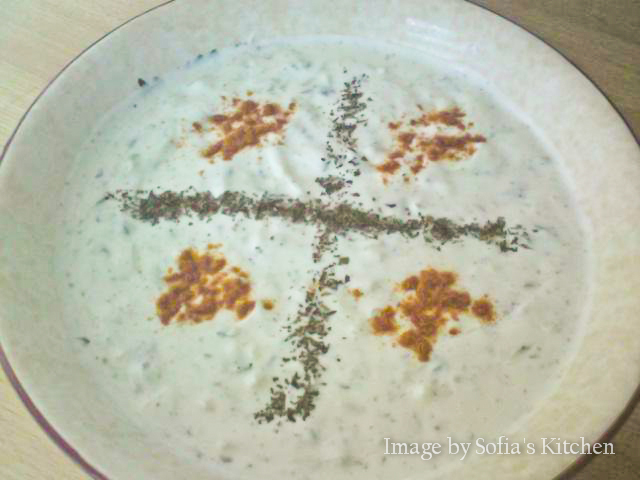 This can be as a side to a main dish or enjoyed on it’s own with pitta bread for dipping!